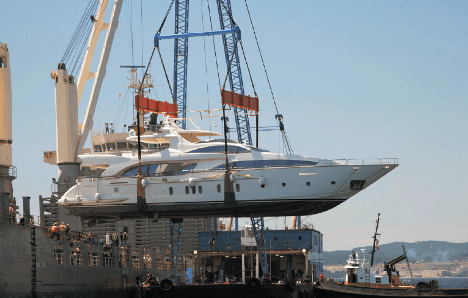 In the case of lift on lift off boat shipping from the USA, this method of transporting a boat or watercraft overseas is better suited for larger yachts and vessels. Not all boats can be shipped using the more common method of roll on roll off, which is why we offer a Lift on Lift off service. Normally, it’s due to height restrictions on larger boats that will not fit inside the hull of the ro-ro vessel. LoLo requires a crane operator on each end of the move so it can be a more expensive way than with the aforementioned method but it depends on the type of watercraft and destination as well. However, our boat and yacht shipping service department is comprised of a team of industry professionals who have years of experience handling large cargo shipments and can work with you to determine the most appropriate shipment type for your situation. The best way to determine the cost to ship your boat and which method is more appropriate is to simply fill out our quote form with the dimensions or call one of our boat shipping specialists. * Services are available to cities worldwide. The following information is important regardless of which method you choose to ship your boat. Make sure to secure any loose items in your vessel. ie. plates, equipment or anything else that is not secured and may shuffle around during the shipment. Empty all fuel and water as well as disconnect the battery cables. Also, make sure to collapse/detach any items that extend vertically or horizontally past the hull. Particularly when shipping a boat with lift on lift off, store the windshields in the cabin. Remove all personal belongings such as clothes, valuables, cash, etc. It is especially important for a lift on lift off service during the winter to winterize the engine, toilets, water system and all other sensitive systems or devices. One thing that will help with the lift on lift off boat shipping process is to make a checklist of the above bullet points to ensure that everything is ready to go for a success shipment.